Conozca la historia marítima de la ciudad y las maravillas del Renacimiento con un guía local. Admira el legendario Teatro La Fenice y el Puente de Rialto. Sumérjase en el ambiente romántico en un paseo en góndola por los famosos canales de la ciudad. The walking tour was great. The guide gave us a lot of interesting information about the history and nuances of life in Venice. She suggested some good restaurants as well. The only let down for me was the gondola ride. First of all I had to sit separate from my wife, wince they were sitting six peiople in a boat but had only 4 seats for couples.I think the arrangement could have been managed better. Also the gondola ride was very silent. 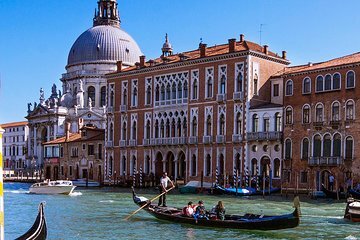 I was expecting the guide to be with us during the ride, since the best way to see venice is from the canals, where you can actually see the landscape and admire the views. The gondola ride was fun but a bit too short. To be honest, our walking tour guide was a bore. He rambled on about things that were not very interesting. When we got to San Marco, he was running a bit behind so he just dumped us there without even saying a word about it's history. We would have liked to learn something about the church and palace and less about the theater and a well. This tour was highly recommended. Gondola ride was the exciting part of it though the walking was very informative. Thanks to our guide. Great tour! There was no way I was paying 80-100 euros for a gondola ride so combining it with a tour was perfect. Tour guide was knowledgeable. Would recommend very good walking tour of the hidden parts and not too long - very informative guide - was a good way to experience a gondola ride at a good price. Our guide for the walking tour was very knowledgeable and quite informative. It was a lot of walking and the group was so large, that at times you were unable to hear what the guide was saying. It would have been much better if there had been two guides and smaller groups. Our gondola ride was horrible. If my daughter had not told me this was not a typical gondola ride I probably would never take another one ever again. Our gondola driver got our gondola directly behind a sewage boat. Not only did the boat smell like diesel fuel all the time, it kept spilling out the waste. The smell was horrible, and I could not stop coughing. I had to use my inhaler a couple of times because breathing became difficult. Even seeing this, our gondola driver continued to stay close to this boat, and this did not make for a romantic, nor enjoyable first gondola ride. They weren't very organized getting people on their way and during the switch between the gondola and the walk. The gondola trip was wonderful. The gondlier was great. Informative and very pleasant. Our walking guide was hard to understand at times and frequently answered she didn't know when asked a question. We have taken many of these walking tours around the world and we were quite disappointed with this one. Had a great walking tour and gondola ride. Thank you. Informative and it was nice to hear about Venice from a locals perspective.